After you have your warehouses set up, you need to be sure that you're using the appropriate view to handle replenishment for your store. 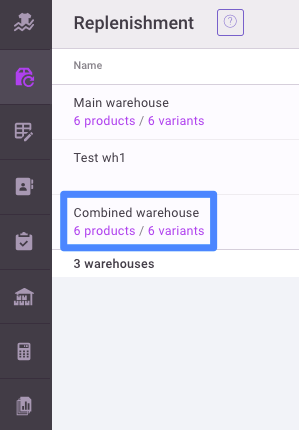 When you have individual warehouses and a combined warehouse set-up, you should use the combined warehouse view to handle replenishment for your entire store. You will then see replenishment needs for all sales channels that feed into the combined warehouse. The stock numbers showing also will correspond to the sales channels connected to the combined warehouse. Note that the channels connected for sales history may be different than the channels connected that show inventory stock levels. Note that you will need to set lead time and days of stock for your combined warehouse. A new warehouse will default to 14 days lead and 30 days of stock. Read our article on how to set up lead time and days of stock. Keep in mind that the lead time for your combined warehouse will cover the time it takes from placing a PO with your supplier to receiving that shipment. If you need to send part of that shipment from one warehouse to another, you should set the lead time for the destination warehouse as the time it will take to transfer the shipment.